This is a highly personal description of the character and work of the great French archaeologist François Bordes, with whom Sackett worked for over twenty years. A native of France’s Perigord region, the prehistory of which he explored for most of his career, Bordes regarded himself as a ‘journeyman field worker’ or ‘homme de terrain’. However his contributions to Palaeolithic archaeology had an impact on the whole of the prehistory of Eurasia and beyond. This was the result of his innovative approaches to excavation and to the analysis of stone tool assemblages. Bordes participated in, and enjoyed debating the controversies between archaeological method and theory – and unfortunately, he also promoted factionalism within the French archaeological community. François Bordes was one of the pre-eminent Palaeolithic (Old Stone Age) archaeologists of the latter half of the twentieth century. His name is associated with no outstanding discoveries comparable, say, to the revolutionary findings of his era being made in sub-Saharan Africa, Eastern Europe, and Australia. And indeed he mostly laboured in what was already the most thoroughly plowed field of Stone Age research, that is, in the rock shelters of the Perigord region of Southwestern France. These are not caves but rather large and deep cavities exposed along limestone valley walls, which served as highly favoured places for repeated Palaeolithic occupations that left a succession of rich archaeological horizons incorporated into the shelter infill deposits as they gradually built up through erosion by the elements. The Perigord’s rock shelter sites traditionally constituted the standard frame of reference for our knowledge of the Middle Palaeolithic (that is, the Mousterian, largely attributed to Neanderthals) and the Upper Palaeolithic (that is, the block of stone tool traditions such as the Aurignacian and Magdalenian, which are conventionally attributed to fully modern Homo sapiens). The importance of Bordes’ work then, lies not so much in the archaeological novelty of his findings, but rather in the innovative approach he brought to the excavations, and in the equally innovative method he brought to analyzing the stone tool assemblages his digging brought to light. These had a profound effect upon the conduct of Palaeolithic archaeology throughout Eurasia, and in some instances well beyond. In addition, perhaps more by chance than design, they played a significant role in the controversies over archaeological method and theory that were overheating New World archaeologists at the time. Other Anglo-Saxon archaeologists (as the French insist upon labeling their British and North American counterparts) might still be found who could create a richer portrait of François Bordes than myself. But I did happen to see much of the man during the last two decades of his life; I frequently worked in close association with members of his research team; and for six years he officially monitored the excavations I directed at the open-air site of Solvieux. I enjoyed cordial – but by choice never intimate – terms with him, and indeed it was not until after his death that I came to appreciate fully his personal qualities and professional accomplishments. In any case, what follows is only a highly personal, sketch of the man and his work. Elsewhere I have written more formal analyses of his archaeological mindset, in publications that can easily be tracked on the web. But the reader should find of greatest interest the recently published collection of essays François Bordes et la Préhistoire, edited by Françoise Delpech and Jacques Jaubert (2011). Henri Louis François Bordes (see Figure 1) was born in 1919 in the Black Perigord region of Southwestern France, a landscape of lofty cliffs, dense stands of forests, and green valleys richly scattered with charming villages that retain much of their Medieval and Renaissance character. However, as evidenced by the appalling slaughter represented by the lists of names on their First World War monuments, village traditional life no doubt seems more charming to passing tourists than to local inhabitants whose roots go deep. Bordes grew up as a member of the provincial bourgeoisie, comfortable and well educated but still – like the rough-hewn peasantry that surrounded it – solidly grounded in the traditional culture, prejudices, and manners of the region. His enthusiasms as a boy involved the then famous Stone Age romance by J.-H. Rosny (1911) La Guerre de Feu, still read and now given new life in the recent American film The Quest for Fire. And, even more important, a bicycle, on which his far-ranging explorations of the Perigord soon gave him a masterful familiarity with its natural history and archaeology. His talents were recognized early, and at the remarkably young age of fifteen he was issued a permit to excavate a rock shelter site at Le Roc de Gauvaudun. In 1936 he entered the University of Bordeaux, majoring in geology and biology, and meeting his future wife – Denise de Sonneville-Bordes – who was to become France’s leading expert on the Upper Palaeolithic period. 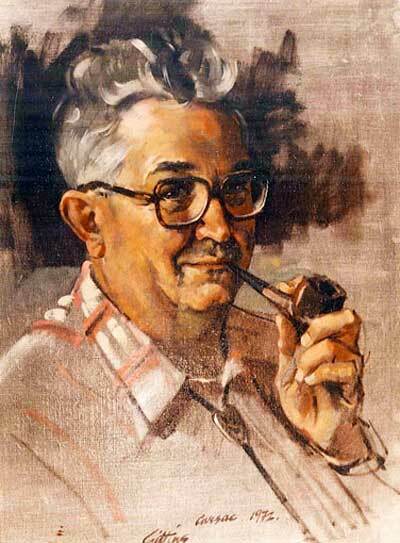 Portrait of Bordes by Alvin Giddens. François Bordes joined the military at the outbreak of World War II, but was soon demobilized after the fall of France – a devastating event that no doubt fed his aggressive chauvinism. In 1942, when the Germans extended their occupation into to the entire country, he joined the Resistance as a Maquisard. He sometimes worked in obscurity as a coal miner to avoid being sent to Germany as a labour conscript. He referred to this period as the time he truly worked in the ‘underground’. Then came a dangerous and eventful two years as a fugitive fighting in the Maquis, followed by another brief stint in the military, which was brought to an end by a serious grenade wound. When the war finished Bordes returned to university life, gaining his doctorate at the Sorbonne (1951) with a classic dissertation that substantially revised the loess and gravel geo-archaeological sequence of the Paris Basin. In 1956 he became established at the University of Bordeaux, quickly gathering about him a coterie of students and researchers in what was to become the famous Institut du Quaternaire. And so Bordes soon found himself reigning over the conduct of Palaeolithic archaeology in the Perigord as a whole. And he remained doing so until his untimely death by heart failure twenty-five years later (in 1981) during a visit to the University of Arizona, Tucson. He was buried in the Perigordian village of Carsac, where he had long maintained a house that served both as his retreat and the operations center for his excavations. Bordes was one of a kind. He was a sturdy, vigorous, restless, volatile man. He could be gruff, rude, and curmudgeonly. His occasional, seemingly uncontrollable outbursts of anger could be as unsettling as they were inappropriate to the occasion. And he cultivated a milder testiness as a kind of art form. To cite but one example: when knapping flint tools, at which he was an expert, it often upset him when he inevitably arrived at the point of exhausting the flake core, which he would then hurl away in disgust accompanied by a yell of ‘Merde!’ (see Figure 2). Although often bad-humored he was nonetheless very good-natured, quite a different thing, especially when he found himself in the high spirited atmosphere of a student site crew, or when working a stratigraphic section with one or two experienced colleagues, or, again, when relaxing in the company of a French household which shared his own cultural background and outlook. Especially among the last, he could be charming, thoughtful, and a delightful conversationalist. His habitual suspicion of other nations never extended to their individual citizens (with the possible exception of the English), whom he welcomed both as crew-members and students. And he was uncommonly generous in sharing his data with any researchers, regardless of nationality, once they had mastered some degree of expertise in the trade. 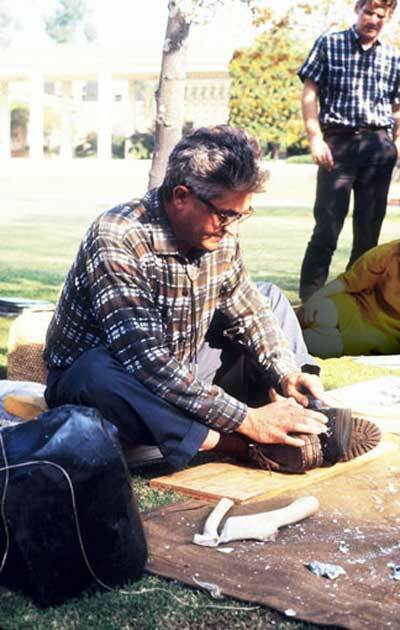 Bordes knapping flint at UCLA, circa later 1960s. I used the word ‘trade’ advisedly because a key facet of Bordes’ character was his pride in being a journeyman field worker, or homme de terrain. Given his natural contrariness, this often tempted him to assume the role of an intellectual philistine. (He once recited a list for me of all of the famous books which he would not want on a desert island, taking care to omit all of the great works most of us at least claim we would consider essential.) Yet, as witnessed by his library and conversation, he was exceptionally well read. Even more importantly, he was a well-recognized writer of science fiction, under the pen-name of Françis Carsac, inspired of course, by his beloved home in the Perigord, publishing seven full-length novels and a score or so of short stories. Interestingly enough, these were translated into several European languages (they were especially well-received in Russia) but were never destined to appear in English. I am not a fan, let alone a judge, of the Sci-Fi genre, but remember being struck by one of his stories, which dealt with a mysterious planet whose inhabitants were totally immobilized by apathy. I cannot help but suspect that the premise especially intrigued, and at some level disturbed, Bordes, who to my knowledge was never incurious, who possessed an almost tactile sensitivity to the world around him, and who was never bored. It bears adding that his career as a popular writer both contributed to, as well as reflected, the remarkably straightforward, unpretentious, and solid style of his scientific writings, which, to my mind have been rivaled by few prehistorians. Although, on balance, I regard Bordes as a remarkable man, and certainly an eminent scientist, there are two forms his egoistic character took which to my mind marred, or at least tempered, his achievement. One was the factionalism he promoted in French academic life, especially marked by his failure to come to terms with the Paris school headed by André Leroi-Gourhan. True, his actions were reciprocated. It is difficult to imagine two such different characters: the blustery, hard-headed geologist from Bordeaux and the somewhat diffident, polymathic, if perhaps over imaginative scholar from Paris. Yet, despite their intellectual differences and remarkably different styles, the two schools played complementary roles and had much to learn from one another. Some sort of reconciliation between the two would have lent a holistic hybrid vigour to French Palaeolithic archaeology that it sorely lacked. A more far-sighted man than Bordes would have realized this. The second fault I see is no doubt related to the first. This was his apparent belief that he had hit upon the right approach to Palaeolithic archaeology and that, consequently, the job of his successors would largely be to work out those of its permutations he himself had neither time nor inclination to pursue. Seemingly, these were likely to amount to little more than intellectual embellishment of what he himself had already achieved. As he once put it to me: ‘Look Jim, I’ve built a town, laid out the streets and sewers and electric lines, and constructed the houses; if you want to put a fountain in the town square, feel free to do so’. Of course, this kind of hubris is not rare in eminent archaeologists habituated to dominating their field, but it is sooner or later defeated by science’s restless need to more or less constantly be taking novel, often unexpected turns. In the face of this one has the choice either of wrestling with the new ways or of moving to another venue where one’s expertise, customary practices, and reputation still carry great value. Possibly this accounts for Bordes ultimately devoting his last three years of research not to the Perigord, but instead, to early man sites in the Murchison Basin of Western Australia. We turn now to Bordes’ professional contribution. It is a daunting task to review this for readers who may not be excited by questions of rock shelter sedimentology, French stone tool typology, and industrial systematics. Probably no corpus of archaeological literature could seem more arcane and inaccessible to the non-specialist than the 170 articles on such topics that make up the bulk of Bordes’ oeuvre. However, he was not simply one of the ablest and knowledgeable practitioners of his trade, but in addition, the creator of an innovative approach whose impact, as we have noted, influenced Old Stone Age research well beyond the Perigord itself. The nature of this contribution is most easily defined in terms of the background against which it arose. Let us call this the ‘traditional’ era – in contrast to the ‘Bordesian’ era – which followed it. Given the taphonomic complexity of their sites and the recalcitrant, one might say defiantly alien, nature of Palaeolithic stone tools, traditional researchers understandably adopted a form of what I call straight archaeology. In other words, they pursued a craft-like involvement with their archaeological record, cultivating a narrowly empirical preoccupation with the typology of its artefacts and the make-up of the deposits from which they derived. Dismissing palaeoethnological interpretation as premature speculation at best, they concentrated their efforts upon industrial systematics – that is, the task of defining typological variation among their stone tool assemblages – and, in turn, taking advantage of whatever light could be shed by stratigraphy, constructing taxonomic skeletons of how the lithic industries they segregated organized themselves over time and space. Their aim, in short, was (and, perhaps, largely still remains) not to interpret, but rather to map the lithic industrial variation that structures the Paleolithic archaeological record. Of course, all disciplines involved in digging up and making sense of the past are based, in one form or another, on straight archaeology. But what set traditional Palaeolithic research apart was the assumption – quite understandable in the light of its empirical grounding in stone tools and stratigraphy, along with its strong historic connection with geology – that the Stone Age archaeological record should be attacked in a manner that emulated the approach that earlier had been used by palaeontologists in unraveling the fossil record. They might use words like ‘culture’ and ‘tribe’ (tribus) but these signify only that stone tools were made by people and that these people were no doubt primitive. Yet, given the quite special nature of their archaeological record, it is not surprising that efficacy (perhaps science’s most powerful tool when confronting empirical ambiguity) prompted them to regard stone implements at least metaphorically as if they were indeed fossils. The most singular expression of this idiom of research was their attempt to ground systematics upon fossiles directeurs, that is, diagnostic artefact types like Mousterian hand-axes, Gravette points, and Solutrean laurel leaves, whose restricted distributions as ‘index’ or ‘zone’ type-fossils in the archaeological record were believed to delineate the major ‘cultural’ traditions (perhaps more accurately termed as ‘industrial blocks’) of Palaeolithic times. Now, the notion of the fossile directeur tended to foster two more implicit assumptions. The first was that the Palaeolithic record paralleled the palaeontological record in such a manner that we can expect to find a one-to-one correlation between its archaeological levels and the obvious natural stratigraphic units of the site deposits in which they are found. The second was that any given industrial complex, like any given paleontological complex, should be more or less invariant in the manner in which it expresses itself: in other words, that a specific stone tool tradition should give rise to but one characteristic type of industry in any specific block of time and space in the archaeological record. Given our current heightened knowledge of the complexity of the Palaeolithic record, it is easy to see how the palaeontological model greatly restricted the grasp of traditional prehistorians. Assuming to find a lock-step correlation between cultural and natural stratigraphy, they deemed it sufficient to excavate a site only in terms of its more obvious stratigraphic units – that is, the often thick zones of relatively homogeneous sedimentological composition which may indeed represent the major episodes of its depositional history but which, at the same time, can in reality incorporate several distinct archaeological horizons that often vary significantly in the details of their typological make-up. 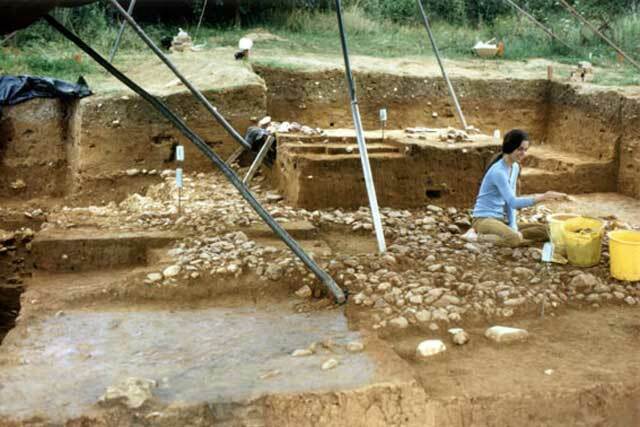 As a result, excavation techniques themselves inadvertently mixed these horizons and consequently blurred the archaeological record. At the same time, the differences that distinguish one archaeological industry from another were framed largely in terms of the presence or absence of the key fossil tool forms. 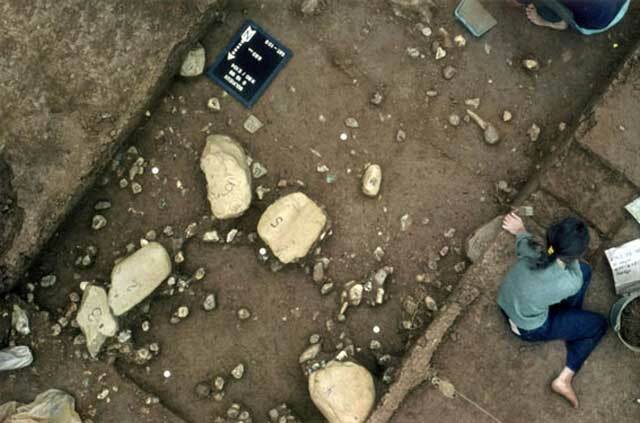 Indeed, so little attention was paid to the supposedly non-diagnostic areas of typology that a large proportion of the stone tool artefacts excavators initially brought to light never found their way back to the laboratory at all. One of the sadder but highly informative tasks any historian of Palaeolithic archaeology should undertake is to occasionally leave off reading the old site reports, and instead excavate the spoil heaps of their excavators in order to discover the amount and kind of lithic material so many of them discarded. As a result of all this, the artefact assemblages recovered for any given time period, within any given region, tended to exhibit a homogeneous and quite stereotyped aspect. And when in turn those from different time periods were compared they inevitably appeared to exhibit fairly distinctive qualitative breaks reminiscent of the manner in which index fossils delineate temporal phasing in geological history. Thus it might be said that prehistorians literally created an empirical archaeological record that did in fact parallel the palaeontological record in consisting of a more or less straightforward succession of industrially invariant stages which could be simultaneously identified and defined by a series of index fossil forms. It should be obvious that all this promoted a kind of methodological circularity whereby prehistorians were capable of observing as excavators only what they had already assumed to be true as taxonomists. To be sure, I exaggerate, over-generalize, and in the case of a handful researchers probably fail to do justice to their efforts. Furthermore, the above paragraphs qualify as no more than informed supposition on my part, since traditional Palaeolithic archaeologists were too insular intellectually and at the same time too bonded by shared if unstated assumptions ever to write explicitly about issues of method and theory. In any event, I believe it fair to state that the traditional logic of inquiry promoted excavation techniques and classificatory procedures that dramatically reduced the ability of researchers to perceive novelty, or to appreciate the more subtle kinds of variability and alternate patterning, that might reside in Palaeolithic archaeological deposits. The above recital of what traditional Palaeolithic archaeologists did should serve to greatly simplify my abbreviated treatment of what Bordes himself did. Although his achievement was massive, it is fair to say that he not so reinvented the field as reformulated it: a matter of clearly perceiving the shortcomings of his predecessors and developing new methods to compensate for them. To be sure, as in any science, many of Bordes’ contemporaries were on the same track, conducted research along similar methodological lines, and in certain respects probably surpassed him. Nonetheless, the bulk of his own contributions, promoted no doubt by his stature in the field and the impact of his personality, so branded European Palaeolithic archaeology in the period 1959–1980 that it is altogether fitting that the era bears his name. My treatment of the substance and bite of the Bordesian approach will no doubt seem colourless to those readers unfamiliar with rock shelter sites like Laugerie-Haute, Combe Grenal, and Pech de l’Azé (see Figure 3), with which his name is directly attached, let alone with those, such as the Harvard excavations at the Abri Pataud, which he generously placed in the hands of foreigners. A serious reader might wish to consult the most exhaustive, if now outdated, treatment available of the world according to Bordes, the book Rockshelters of the Perigord (1980) authored by Henri Laville, Jean-Philippe Rigaud, and myself. Here, however, we must be content with the barebones of the story. Bordes excavating at the rock shelter of Pech de l’Azé with student crew. To a great extent, what might be called the Bordesian approach simply involved a strategy designed to greatly enhance the overall quantity and quality of the data that were realized from the archaeological record. Excavation techniques now took on the character of stratigraphic dissection whereby artefact assemblages were segregated, not according to a site’s major depositional blocks, but instead with reference to the specific ‘occupational’ horizons and the minimal sedimentological units discernible within them. (In some instances this led to a nearly ten-fold increase over the divisions traditional excavators earlier recognized at the same sites.) All lithic material, including unused tool blanks and industrial debris was saved along with the standardized tools shaped (as a rule) by retouch. They were richly documented with respect to their provenance and, equally important, accompanied by representative samples of faunal, palynological, and sedimentological data, carefully segregated with reference to their respective archaeological horizons. This latter information was employed to develop a chronostratigraphic approach to space-time systematics, wherein the design of regional space-time schemes entailed a holistic level-by-level correlation of the site stratigraphies involved, founded as much upon their palaeoenvironmental contents as upon the artefactual contents of their occupational horizons. While it might fairly be argued that such advances in the technology of archaeological research were simply refinements of earlier sampling and analytic procedures, their combined effect was nevertheless, to cause a leap in the degree of resolution with which prehistorians were able to observe and control the archaeological record. Moreover, although they constitute common practice today, this was not the case a half-century ago – at least in France. No less important, this effort was complemented by a new approach to systematics that had an equally profound effect. In brief, the traditional concept of the qualitative fossile directeur was set aside in favour of the notion that it was the relative frequencies of several tool types viewed in the ensemble, rather than the presence or absence of a few of them viewed individually, that was essential to refined systematics. Again, the basic idea was not new. But it was Bordes who first saw clearly that translating the notion of what one regards as industrially diagnostic into quantitative terms was not simply a matter of counting, but in addition that it required the introduction of two new elements into the methodology of systematics. One was that artefact typology and the ordering of archaeological assemblages must constitute distinct procedures: in other words, that the definition of an assemblage’s formal content must be operationally distinguished from its genetic affiliations to other assemblages in space-time systematics. As we have seen, this distinction was never clearly made in the traditional approach, since it was the inherently circular role of fossile directeurs to define simultaneously an assemblage’s content and assign it within some larger ordering scheme. The second was that artefact classification must be extended to the entire range of formal variation occupied by recognizable tools rather than simply to those specific areas that potentially possess the greatest diagnostic value in assemblage ordering. This ‘banalization’ of artefact classification in the form of standardized type-lists made it possible for every artefact, recognized as a purposefully fashioned stone tool, being assigned to a specific type category and subsequently being counted. Obviously, without this global typological inventorying, which was by no means consistently recognized in traditional systematics, quantitative statements about relative tool frequencies lost most of their meaning. Armed with its comprehensive type-lists and some relatively simple but effective techniques of statistical description, Bordesian systematics revealed that the archaeological record was a vastly more complicated affair than the traditional approach envisaged. Perhaps most importantly, we no longer conceived of it as comprising simple linear successions of stereotyped industries, but instead as a complex of highly polymorphic industrial complexes which assumed a variety of alternate expressions at one and the same time in any given region. Bordes coined the term évolution buissonnante (literally ‘bushy’, but perhaps better translated as ‘ramifying’, evolution) to account for this polymorphism. And here arises an unresolved issue regarding the nature of Bordes’ thought. The term évolution buissonante obviously has a palaeontological ring to it and in his mind may well have had more than simply metaphorical value. We must ask then whether Bordes’ innovations, regardless of how important, were still largely a matter of methodology rather than of theoretical perspective. In other words, did he in fact continue to embrace the traditional ‘palaeontological’ mindset? We can only give an equivocal answer, reminding ourselves in passing, that the fact that ideas which cohabit in one and the same mind are not necessarily logically interdependent, and that some indeed may logically preclude others. 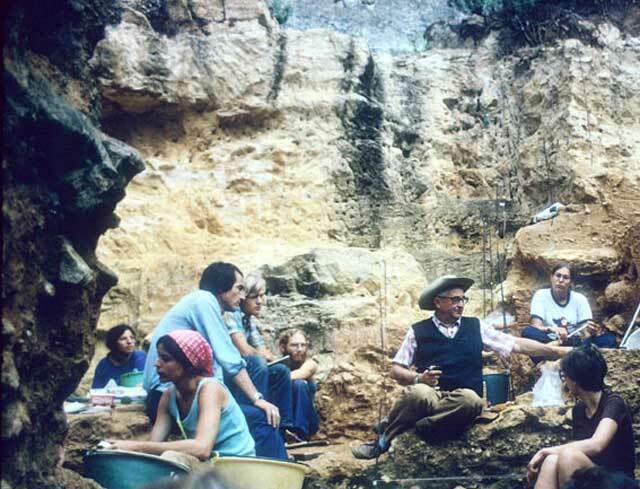 For one thing, Bordes enthusiastically promoted many projects which were framed by ‘anthropological’ aims, such as the search for habitation structures by the eminent amateur prehistorian Jean Gaussen (see Figure 4), one of the pioneers of open-air Palaeolithic research in a region hitherto dominated by rock shelter excavation. Gaussen’s results ultimately led to my own work at the vast open-air station of Solvieux, at which Bordes himself served as co-collaborator. And one of our principal aims, or at least hopes, was to establish recurring clusters of horizontally segregated ‘tool kits’ whose distribution might serve at least as a kind of structural grammar – if hardly an explanation – underlying the patterns of activities conducted on Palaeolithic living floors. The idea was not a new one, to be sure, as attested by much of the work begun earlier by prehistorians in sub-Saharan Africa and by the splendid open air sites being attacked at the same time as our own by Leroi-Gourhan’s group in the Paris Basin. 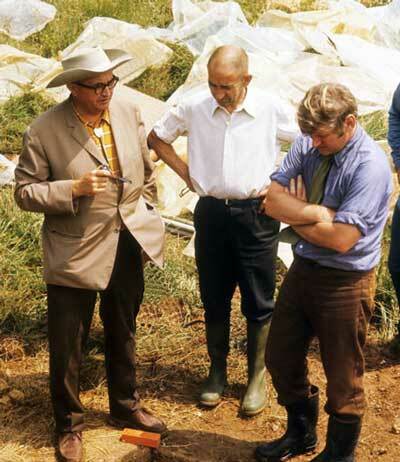 Bordes (note cowboy hat and bola tie), Dr. Jean Gaussen, and author at the site of Solvieux, the largest excavation in an open-air deposit in the Perigord. Gaussen, a pioneer in open-air research, was the last of the great French amateur prehistorians. Yet, on the other hand, and much more familiar to the North American audience, was Bordes’ redefinition of the Mousterian as a polymorphic complex of four distinct tool complexes, or assemblage-types, which supposedly interstratified in the rock shelters of the Perigord and which he consequently assumed to be somehow quasi-contemporary. Here his thinking does seem to have palaeontological overtones, since he argued that these assemblage-types had independent genetic connections to earlier, pre-Mousterian (that is, lower Palaeolithic) industrial traditions. Since Bordes sometimes referred to these connections as being ‘cultural’, it seemed to follow – at least when filtered through the mindset of anthropologically trained American archaeologists – that he believed that the Mousterian assemblage-types themselves actually represented four distinct ethnic groups, or ‘tribes’, which somehow shared the Perigord more or less simultaneously. And, their argument continued, would not a more likely explanation be that the assemblages, in fact, represented four different sets of spatially segregated activities conducted by one and the same ethnic group, rather than more or less the same set activities practiced by four different ethnic groups? Finally, it did not require, at least among the New archaeologists of the time, much of a reductionist intellectual jump to see in Bordes’ alleged position a parallel to the outmoded ‘normative’ approach they attributed to traditional Americanist archaeology, in contradistinction to the ‘processual’ approach they themselves advocated. The most noticeable reaction to this particular instance of Bordes-style polymorphic variability (at least in the sense that bellowing smoke is the most noticeable attribute of a steam engine) was of course the so-called Mousterian debate between Bordes and Lewis Binford. To be sure, the basic issue it raised was of the utmost importance, particularly in prehistoric archaeology: how are we to distinguish in the archaeological record between what might be called activity and ethnicity, task and group, in other words, between what was going on and who was doing it? We best not attempt to untangle the course of the debate here, however, because my own view of the affair was far from impartial. Suffice it to say that, to my mind, the direction it took was in about equal measure salutary and damaging to the progress of archaeological thought in this country and to the manner in which New World archaeologists regarded their Old World colleagues. In any event, our concern here is François Bordes, whose role in the business was marked by ambiguity and irony in about equal measure. For one thing, it was already starting to become clear to him by this time, as well as to many other knowledgeable researchers at the time, that his four assemblage types did not adequately organize Mousterian industrial variability. For another, fault lines were beginning to appear in his chronostratigraphic scheme for the Perigord which suggested that the assemblages were not in fact contemporaneous in the manner Bordes first thought. Furthermore, it had become clear that to successfully segregate artefactual remains according to ‘living floors’ (sols d’habitat) representing true occupational episodes was a tricky business even in the most promising sedimentological contexts (see Figures 5 and 6). Hence the premise on which the debate was founded became questionable fairly early in the game. A horizontal exposure of a stone pavage found in the uppermost Palaeolithic occupation floor at Solvieux. A horizontal exposure of a stone pavage found in the uppermost Paleolithic occupation floor at Solvieux. Then again, Bordes himself actually debated very little, at least in print, and then largely in English. For the issue was very much an Anglo-Saxon affair which was met with a mixture of bemusement, if not indifference, in France itself. Finally, to be frank, it would be interesting to know whether the ‘debate’ itself was not something of a canard in any event. The only source for many of the popular notions Americans hold about it derive from the imaginative Selbfestschriften which Binford himself wrote as companion pieces to his own articles. This is not to say, I hasten to add, that Bordes would not have enjoyed a confrontation with Binford along personal lines. Although I never saw the two of them together, I suspect that Bordes was genuinely attracted to Binford, a man whose intelligence, brand of humour, combativeness, and need for self-assertion matched his own, and who – not being a Palaeolithic archaeologist himself – could enthusiastically confront Bordes in a manner he might not tolerate from a fellow expert in the trade. There is little I can add, since I can recall Bordes speaking to me only twice about the matter, and even then simply in the form of casual remarks tossed off during the course of fieldwork. The first time, he said that he in fact initially suspected that the Mousterian assemblage types were indeed activity-specific, most likely representing varying expressions that one and the same culture might take in its seasonal rounds; and that he only later abandoned this view because he could find no corresponding differences in their associations with faunal assemblages, hearths, site organization, and so forth. I took this to mean that he viewed the question of Mousterian variability – as he did most Palaeolithic issues – as a largely empirical question that could only be resolved on strictly empirical terms. Here of course he was speaking in the guise of a straight archaeologist for whom palaeoethnological interpretation could wait. The second time the subject came up his words took a more cynical turn: in short, that the debate’s real value lay in the fact that it was an easily grasped and easily popularized matter that served to promote his reputation among Anglo-Saxon archaeologists and students who were otherwise too ignorant of Palaeolithic archaeology to know the difference between a burin and a hand-axe. Given my own nationality, it seems fitting to round out this essay with some comments about Bordes’ adventures in my own country. He first saw it in 1959, revisited numerous times, and ultimately met his untimely death there. His feelings about the USA, true to his contradictory character, were highly mixed, because he was intensively chauvinistic, as we have seen, and in fact viscerally anti-American when it came to matters of foreign policy. Some of his remarks on the topic were callously insensitive, especially to those of us who had lost family, friends, and neighbours on French soil in two World Wars. Yet his love of our land, as opposed to our nation, was itself altogether genuine. He was particularly attracted, as are many Europeans, by the vast and raw beauty of the Southwest, an attraction no doubt enriched by an almost juvenile nostalgia for the lore of the old Far West created by American cowboy novels and movies. And there was something in the openness of the American character he particularly enjoyed, perhaps, fairly or not, in contrast to the supposed reserve of our Anglophone counterparts across the ocean. (I suppose it was a similar openness that was to draw him so strongly to Australians). My impression is that Americans were more likely than his own countryman to find him in a relaxed, congenial, and receptive mood. In part this was due to the fact that he was as welcome in New York as in Los Angeles, in Chicago as in San Francisco. And intellectual life in America probably seemed less factionalized and partisan than it is in France (a fact, as we have seen, for which he himself must bear some responsibility). Then too was the great esteem he enjoyed among American replicators of stone tools, stemming from his early association with Donald Crabtree. Knappers all belong to the same fraternity and practice a craft and mindset that over-rides ethnic, linguistic, and even archaeological boundaries. As a result, Bordes was able to forge close and empathetic bonds with skilled colleagues who may never have known nor cared how the stratigraphy of Pech de l’Azé correlates with that of Combe-Grenal. They provided him with a kind of intellectual vacation. Bordes was fond of American students, and they reciprocated warmly. They found it difficult to resist someone who loved to show off, and spoke so colourfully and amusingly in an uncompromisingly strong French accent, all the while sporting a cowboy hat and a Far-West bola tie. But, at a more fundamental level, they felt the force of his scholarly dedication and eagerness to share his knowledge; they appreciated the fact that he took them seriously, even if they did not always have the preparation needed to follow the details of his argument. I believe this is why he took so much care in writing that lucid exposition of Mousterian archaeology, A Tale of Two Caves (1972), which sadly to my knowledge never appeared in another language. Bordes’ relations with his fellow prehistorians in America are not so easily summarized. While he was highly respected by nearly all – he was (and remains so thirty years after his death) – the center of controversy with respect to theoretical matters. I doubt he took it all too seriously. To be sure, he admired the accomplishments and vigour of North American archaeologists, and for obvious reasons followed developments in Palaeo-Indian research closely. But he never bought into the proposition that archaeology is anthropology or it is nothing. And he seemed to find the philosophical posturing of the New Archaeology of his era pretentiously naive. At the same time, he seemingly felt that the problem was exacerbated by the fact that most American archaeologists at the time were to be found in academic departments, intellectual settings whose nature it is to promote theoretical controversy for its own sake (especially among those of its members who otherwise would have nothing of substance to say). I suspect he held, probably rightly, that American archaeology would be better served if the country possessed a semi-independent, empirically oriented scientific establishment comparable to the excellent Centre National de la Recherche Scientifique, which supplied the bulk of the full-time archaeological researchers in France. Again, of course, I simplify. No one denies that a scientific engine cannot be driven without good theory, and Bordes knew this as well as any American. But to the end he remained a militantly down-to-earth ‘homme-de-terrain’. It was ignorance and intellectual pretension, not ideas as such, that he opposed. And if he sometimes struck Americans as being diffident and over simplistic in dealing with theoretical questions, we must keep in mind the dualistic nature of his character. For archaeological theory must have seemed rather dull in comparison to the rich store of novelty and imagination which he found in sharing the same mind with his alter ego, Françis Carsac. Perhaps Americans would have had a greater and more nuanced appreciation of François Bordes had they also been given the opportunity to know Francis Carsac. But Carsac, unfortunately, never spoke a word of English. A highly similar version of this article appeared in Backdirt 2011, the annual magazine of the Cotsen Institute of Archaeology at UCLA. © UC Regents.